What is Key West Flats Fishing? 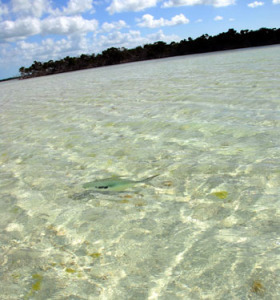 Flats fishing in the Keys is a spectacular experience for anglers of all abilities. The area of water the surrounds the Florida Keys is fairly shallow. There are many areas we call flats that are made up of sand and turtle grass, with deeper channels running in between them out into the Gulf of Mexico and the Atlantic Ocean. Throughout the day the tide changes washing water and smaller organisms over the flats. Permit and bonefish search for small blue crabs about the size of a silver dollar. We often see these fish tailing in water so shallow that their fin and tail break the surface of the water. It is truly an amazing sight. Other fish that feed on the flats in search of the same food are jack crevalle, sharks, barracuda, mutton snapper, and tarpon. You can only truly get an idea of how the flats fishing picture comes together if you come fish in Key West for yourself.